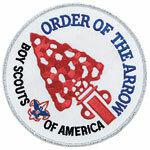 The Order of the Arrow (OA) is the national honor society of the Boy Scouts of America (BSA). It uses American Indian-styled traditions and ceremonies to bestow recognition on scouts selected by their peers as best exemplifying the ideals of Scouting. The society was created by E. Urner Goodman, with the assistance of Carroll A. Edson, in 1915 as a means of reinforcing the Scout oath and the Scout Law. The goal was to establish these as lifelong guidelines, and to encourage continued participation in Scouting and camping. Influence in part by camp traditions, and Indian folklore, the OA uses "safeguarded" symbols, handshakes, and ceremonies to impart a sense of community. Inducted members, known as Arrowmen or Brothers, are organized into local youth-led lodges that harbor fellowship, promote camping and render service to Boy Scout councils and their communities. Members wear identifying insignia on their uniforms, most notably the OA pocket flap (representing their individual lodge) and the OA sash (worn at official OA functions) and are eligible for special OA awards. The OA program sponsors several events, awards, and training functions. Troop 143 is part of Woapalanne Lodge 43. The below listed were elected into the Order of the Arrow.